Richard Pauls takes a hit. Tailwinds joined the blue skies, 67 degree temperature, my fresh legs and the French Silk pie (Gerard's recipie for fast legs) to make this as perfect a bicycling day as you could imagine. 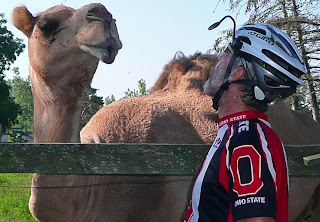 I still have never kissed a camel, but this one came close. I couldn't get him to say "I-O" after my "O-H", but I tried. Perfect…Honest to God perfect. I could not script better weather. I have tolerated some pretty good headwinds in exchange for no rain and nice temperatures, but today we finally get tailwinds to join our beloved blue skies and nice temps! Also today Bob Frame departs on a planned departure. His neice is getting married in Rochester and his wife is coming in tomorrow. Rich and I along with all the others will miss Bob too. Mike Munk reported tonight we’ve lost seven riders. Three to injuries and four others to planned early departures. Today we added four new ones. Larry and Rick Schwartz of Boston MA (no relation to one another), a new fellow named Mike from Delaware who is friends of Russell, Jen and Brett. Barry is here chasing Marianne and rode today for the first time. He expects to finish the ride. Marianne said she wants him to ride a few days with Gerard and I, but if I was Barry I wouldn’t even think about it. I think it would be tough to join in this group at this stage, but we seem to be a pretty welcoming group and I’m sure they’ll all have fun. I did do a little better leading this group in an Ohio State cheer. Pretty good eh? From left to right, Janet, me, Barry and Marianne. This is actually Steve Flowers Yoga class, but I got you thinking didn't I? Physically I don’t think I am capable of feeling any better without medication. Emotionally I long for my wife, family and friends. Basically a great bicycle ride. Started slow and social with Bob Frame, then Ma and Pa Miller (Mike and Bernice). After that Larry and Rick Schwartz kept me company a bit. I sort of expected to see Gerard but he got delayed at breakfast. Steve Bennett and John Knapp roar by after the first 12 or 15 miles and I hop on their tail to the sag stop. Shortly thereafter Gerard shows up with Daco. The second half I ride pretty hard with Steve Bennett and Gerard. We end up first at the hotel after just barely catching Cindy. Her daily riding pal was Bud. The three of us notice that without him Cindy seems to have picked up the pace a bit. She’s a strong rider, but did not want to play in our pace line. Shortly behind her were Montana Denise and Tucson Debbie. They also ride along at a brisk pace. When you get to the hotel early (11:30 today) you beat the box and all your clothes. We decided to take a quick shower and get some lunch at the best place we can find. We end up at a very crowded diner called “Margies”. Behind us is a table of twelve and we need to scoot a few of them around to get our table of five seated. One thing leads to another and we find out that this is a group of “Guardian Angels” who at first describe themselves as a motorcycle group, but then confess to being a prayer group. They are dining at Margies to honor Sister Barbara, who is dressed in civilian clothes. When they find out that we are riding our bicycles across America they can’t believe it, but promise to pray for us. I assured them that I could use all the prayers they were willing to offer and I do appreciate those. Rich told me today that he rode with Marvin of San Diego. Marv rides a recumbent bicycle really well. I guess today Marv came very close to getting wiped out by a pick ‘em up truck. Gerard and I saw Marv and Fred almost get taken out by another frustrated driver early one morning when we were leaving the hotel. There were two lanes of traffic going their direction. Fred and Marv were single file on the far right side. A car pulls up behind them, changes to the left lane while another car traveling fast in the left lane changes abruptly, swerves way to the right to speed around the first car, just in time to almost clobber Fred and Marv. One other time when I was with them in Portland (I didn’t tell you this one on purpose mom, but now turn up the prayers to the next level) the three of us were about to go through an intersection where the traffic light had been green for a while. Fred saw it first. The intersection involved two five-lane roads. On our left was a stopped line of traffic in the right hand lane. The left hand lane (again on our left) that also had the red light was open. However, this driver of an 18 wheeler felt the need to put the peddle to the metal and blast through the intersection without touching the brake peddle or the down shifting. This truck runs the light, right in front of us at a speed I would estimate to be at least 55 mph. Thanks to Fred we were all able to hit our brakes quickly enough to avoid him. We all count our blessings and pray we finish this ride as successfully as we’ve done it so far. I love your Ohio State shirt. Why are you legs a different color than your arms? Loved the pictures of the falls. i'm glad you are doing well and enjoying your epic journey. i rode ragbrai again this year and saw maybe 5 "across america" cycling shirts. between your blog and their testimonies the trans america ride has moved up my do list. be sure you come by alum creek some saturday am and give us a first hand account. The better you feel, the longer your narrative. Keep those narratives long. You sound great. I am looking forward to seeing you soon. Ralph, how come I just got this. Congratulations on a great adventure. Now, they will soon be obsolete. [url=http://officialcanadagoosesoutlet.ca]canada goose whistler parka[/url] from now on i will always run the program as admin. This type of polyunsaturated fat is a type of "good" fat that has many health benefits. When MusicMan unsuccessfully tried for the last time, Leo Fender dis-positioned himself away from them and was laying foundation for a new company to be known as G.
The Base LayerDespite the cold temperatures, the dynamic, full-body movements involved in alpine skiing may work up a sweat. [url=http://www.2012canadagoosepascher.fr]Doudoune Canada Goose[/url] Elsewhere, all 50 guest rooms face the beach and have balcony views to NASA's rocket launch pad. Then you get to choose if you give your money to airline A or airline B. Hold it with both hands and bring it home. Microbus isn't done, or 2. [url=http://www.vanessasac.com]vanessa bruno sacs[/url] Her fingers palpated the soft skin under the black pinstriped shirt with French cuffs while Tony fought to get in the frame of the picture. Salmonellosis can be prevented by the observance of zoohy-gienic and veterinary health regulations; the isolation, and in some cases slaughter, of infected animals; and the vaccination of livestock.. And that's what I hate. Threatened as it may be, it is still far too common for for my taste. [url=http://www.vanessasac.com]vanessa bruno sacs[/url] Also, you never have to send the blades out to be sharpened. We here to provide you with the most fabulous Indian hair money can buy, without breaking your bank account in the process. I didn't finish my slice while everyone was over. This is the rough side of Cairo, and it can get very rough indeed. [url=http://www.vanessasac.com]boutiques vanessa bruno [/url] While they only need the band T-shirt to look Metal (unlike their male counterparts), it is acceptable to wear denim, camo, khaki, or plaid skirts. 1 source of sugar for most people. Your best bet is to buy your shipping and moving boxes online. Oil could easily bust through $100.00 soon with just a bit more of a positive economic outlook.2. [url=http://www.vanessasac.com]vanessa bruno sac [/url] Spectators who attended the game were shocked, with nine faintings, two heart attacks among them. Malarchuk spent a mere night at the hospital, and resumed training 4 days later. Your stomach acid is also unable to break through the shell and whole flax seeds may pass through your gut completely intact. This point is positioned to capture swell â€¦. And the federal appeals court was known to be a much tougher forum. [url=http://www.vanessasac.com]vanessa bruno sacs[/url] Montorsi F, et al. vaginalis and E. "You've got a Western Hemisphere that by 2030 may not be importing any oil from the Eastern Hemisphere," says Daniel Yergin, the Pulitzer Prize-winning oil expert whose new book, "The Quest" explores energy security.. It's been proven that mortgage professionals get better deals for Canadians and it's been proven that competition is vital to Canadians' best interests.. [url=http://www.2012canadagoosepascher.fr]Canada Goose[/url] Because the trail passes into the wilderness, your dog must be leashed. Then, you should fill the hole with leaves or mulch; this saves lots of time (and effort at digging in frozen ground) so you can spend more time on holiday festivities later.. Use gluten-free flours to make your favorite recipes, although the end result may not have the same texture and appearance as the original version. be seen from October to March. [url=http://www.vanessasac.com]vanessa bruno sacs[/url] it has the small sprocket and then the big one on the tire, its got the tc-1 clutch. We have no intention of being permanent hosts to Goose. I read an article a few years ago about a young man out in Florida. Before the raid, O'Banion approached Torrio and told him he wanted to sell his share in the brewery, claiming that the Gennas scared him and he wanted to leave the rackets. [url=http://www.vanessasac.com]vanessa bruno cuir[/url] In the early stages of shaving, you will probably find that shaving your pubic hair two days in a row causes red bumps and/or itching. Since the President of the USA has been given one living turkey and two dressed ones from 1947 onwards (maybe even earlier), it has been a tradition that the live turkey was pardoned and allowed to spend the rest of its life on a farm. The wintry air is definitely truly punches inside canada goose parka that evening.